In a book and an exhibition with the same title in the Witte de With Center for Contemporary Art in Rotterdam, the artist duo Bik Van der Pol used Witte de With’s exhibition archives to investigate what its memory looks like. Inventorying what was left they have now given the remnants or traces a new home. 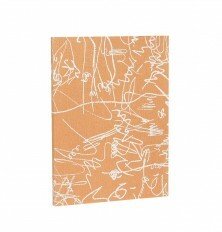 This conceptual book is a report of the duo’s critical examination and can be seen as an artwork in itself. With a well edited visual narrative composed of photographs taken during this process, we are led through the book like a forensic investigator examining the boxes of archives. Here and there our progress is interrupted briefly by inserted pages of text. The typography here, like that of the boxes, is staggered; the inventory list at the back gives us some wonderfully designed pages. Nicely printed on soft Cyclus Offset. Although the book is difficult to take in at a single sitting – and regrettably the complex blurb does little to make penetrating it much easier – it is only right to give credit where it is due: here we have an established arts institution bold enough to question its own role in this way, and to publish a well turned-out publication of the results. Amount of pages: 292 p.